Lean Thinking: Agriculture - The Next Frontier? Agriculture - The Next Frontier? The past several years the Lean Pathways team and I have been lucky enough to work in agriculture. Good, smart, well-trained people, an instinctive grasp of the PDCA cycle, and a solid ethical foundation. We should tip our hats to farmers & agricultural industry. The past few decades, they've led a technological revolution. Yields have increased exponentially through better crop varietals and farming methods. Despite the dire warnings of the 'doomsters', food is more plentiful than ever. We've seen marvelous kaizen in farming technology. 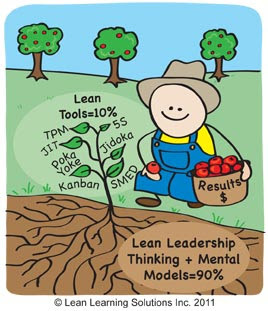 Now we have to extend Lean thinking into farming operations. Value/Waste consciousness, visual management, standardized work, and other Lean fundamentals, have the potential to extend & deepen farming's transformation. Should be a great ride - GIDDY-UP!